You'll discover tucked-away gems like Kailua Beach Park and Lanikai Beach. You'll enjoy a bit of beach vacationing at Waikiki Beach and Keawaula (Yokohama Beach). Step out of Honolulu with an excursion to Banzai Pipeline in Pupukea--about 1 hour away. Next up on the itinerary: see the interesting displays at USS Bowfin Submarine Museum & Park, steep yourself in history at Battleship Missouri Memorial, and see some colorful creatures with a scuba or snorkeling tour. To see maps, reviews, where to stay, and tourist information, read Honolulu trip planner . Melbourne, Australia to Honolulu is an approximately 13.5-hour flight. The time zone difference when traveling from Melbourne to Honolulu is minus 20 hours. Plan for somewhat warmer nights when traveling from Melbourne in March since evenings lows in Honolulu dip to 23°C. Finish up your sightseeing early on the 4th (Mon) so you can travel to Kihei. Get in touch with nature at Ho'okipa Beach Park and Wailea Beach. You'll explore the less-touristy side of things at Napili Beach and Ulua Beach. Venture out of the city with trips to Lahaina (Baby Beach, Lahaina Banyan Court, & more) and Haleakala Crater (in Haleakala National Park). There's much more to do: enjoy the sand and surf at Po'olenalena Beach, get up close to creatures of the deep with a dolphin and whale watching tour, and stroll through Kalepolepo Beach Park. For maps, ratings, and tourist information, go to the Kihei trip planner. Getting from Honolulu to Kihei by combination of flight and taxi takes about 2.5 hours. Other options: do a combination of flight and car. In March in Kihei, expect temperatures between 32°C during the day and 21°C at night. Wrap up your sightseeing by early afternoon on the 10th (Sun) to allow time for travel to Marathon. 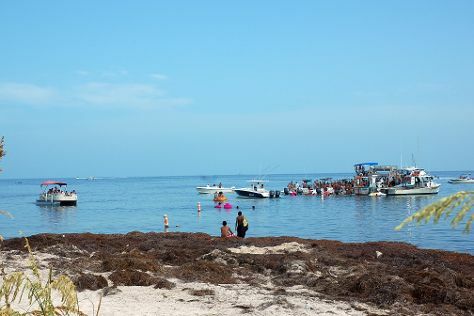 Kick off your visit on the 11th (Mon): kick back and relax at Sombrero Beach, look for all kinds of wild species at The Turtle Hospital, and then kick back and relax at Bahia Honda State Park. Keep things going the next day: identify plant and animal life at Dolphin Research Center, look for all kinds of wild species at Crane Point Museum & Nature Center, and then look for all kinds of wild species at Marathon Garden Club. Planning Marathon trip won't be overwheling when you use's Insprock itinerary maker. Do a combination of taxi, flight, and bus from Kihei to Marathon in 14.5 hours. Alternatively, you can do a combination of taxi, flight, and shuttle; or do a combination of taxi, flight, bus, and shuttle. Due to the time zone difference, you'll lose 5 hours traveling from Kihei to Marathon. March in Marathon sees daily highs of 32°C and lows of 24°C at night. Finish your sightseeing early on the 12th (Tue) to allow enough time to take a bus to Key West. Popular historic sites such as Audubon House & Tropical Gardens and Fort Zachary Taylor are in your itinerary. Get in touch with nature at Dolphin & Whale Watching and The Overseas Highway. Spend the 14th (Thu) exploring nature at Dry Tortugas National Park. There's much more to do: examine the collection at The Ernest Hemingway Home and Museum, take an in-depth tour of Truman Little White House, look for all kinds of wild species at Key West Butterfly & Nature Conservatory, and see what you can catch with a fishing tour. For reviews, traveler tips, where to stay, and more tourist information, you can read our Key West road trip planning website . Traveling by bus from Marathon to Key West takes 1.5 hours. Alternatively, you can drive. In March in Key West, expect temperatures between 30°C during the day and 24°C at night. Wrap up your sightseeing on the 16th (Sat) early enough to travel to Grand Canyon National Park. Step out of the city life by going to Grand Canyon South Rim and Bright Angel Trail. Spend the 18th (Mon) exploring nature at Grand Canyon National Park. There's still lots to do: trek along Rim Trail, stroll through Tonto Trail, take in breathtaking views at Yavapai Point, and take some stellar pictures from Maricopa Point. For traveler tips, ratings, photos, and tourist information, read our Grand Canyon National Park trip itinerary tool . Traveling by combination of flight and bus from Key West to Grand Canyon National Park takes 13.5 hours. Alternatively, you can do a combination of flight and shuttle; or do a combination of flight, shuttle, and bus. The time zone changes from Eastern Standard Time to Mountain Standard Time, which is usually a -2 hour difference. Plan for colder temperatures traveling from Key West in March, with highs in Grand Canyon National Park at 16°C and lows at -5°C. Wrap up your sightseeing on the 21st (Thu) to allow time to travel to Kailua-Kona. Eschew the tourist crowds and head to Jagger Museum and Pu'uhonua O Honaunau National Historical Park. Get outdoors at Hapuna Beach State Recreation Area and Honaunau Bay. When in Kailua-Kona, make a side trip to see Papakōlea Green Sand Beach in Naalehu, approximately 1h 50 min away. Next up on the itinerary: take your sightseeing to a higher altitude at Mauna Kea, get up close to creatures of the deep with a dolphin and whale watching tour, head outdoors with Keauhou Bay Adventures, and enjoy the sand and surf at Kahaluu Beach. To see other places to visit, photos, traveler tips, and more tourist information, you can read our Kailua-Kona online trip itinerary builder . Traveling by combination of bus and flight from Grand Canyon National Park to Kailua-Kona takes 13 hours. Alternatively, you can do a combination of bus, taxi, and flight. The time zone changes from Mountain Standard Time (MST) to Hawaii Standard Time (HST), which is usually a -3 hour difference. Plan for much hotter temperatures traveling from Grand Canyon National Park in March, with highs in Kailua-Kona at 32°C and lows at 24°C. Wrap up your sightseeing on the 26th (Tue) early enough to travel to Poipu. Poipū is a census-designated place in Kauai County on the southern side of the island of Kauai in the U.S. Kids will enjoy Poipu Beach Park and Mahaulepu Beach. You'll get in some beach time at Makawehi Bluff and North Aliomanu Beach. Explore Poipu's surroundings by going to Kayaking & Canoeing (in Kapaa) and Waimea Canyon State Park (in Waimea). The adventure continues: see majestic marine mammals with a dolphin and whale watching tour and see the world from above with a helicopter tour. To find maps, more things to do, ratings, and more tourist information, use the Poipu trip planner. Traveling by combination of flight and taxi from Kailua-Kona to Poipu takes 3 hours. In March, plan for daily highs up to 30°C, and evening lows to 22°C. Wrap up your sightseeing by early afternoon on the 30th (Sat) to allow enough time to travel back home.